Dear musicians of Mojo City! The Binaural Musical Corporation of Mojo City yields to your multiple requests and issues an extra edition of vinyl discs for the famous musicians (11-25 levels)! 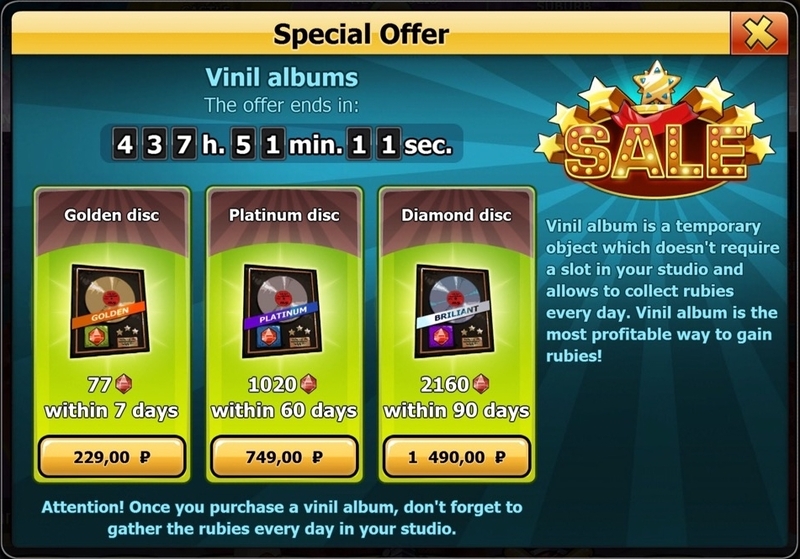 Hurry up to use this generous offering: vinyl disc is not just a sign of prestige, but a perfect source of the rubies at incredible discount! You can purchase vinyl albums only since 4PM GMT February 20 till 11AM GMT February 24 in a special shop on the city map. Relaunch the game if the shop doesn't appear automatically in due time. Attention, the offer is limited! Shall you miss the chance to purchase an album, you'll become a subject of cruel jokes!